By CNN'S JEREMY GRISHAM AND HOLLIE SILVERMAN CONTRIBUTED TO THIS REPORT. 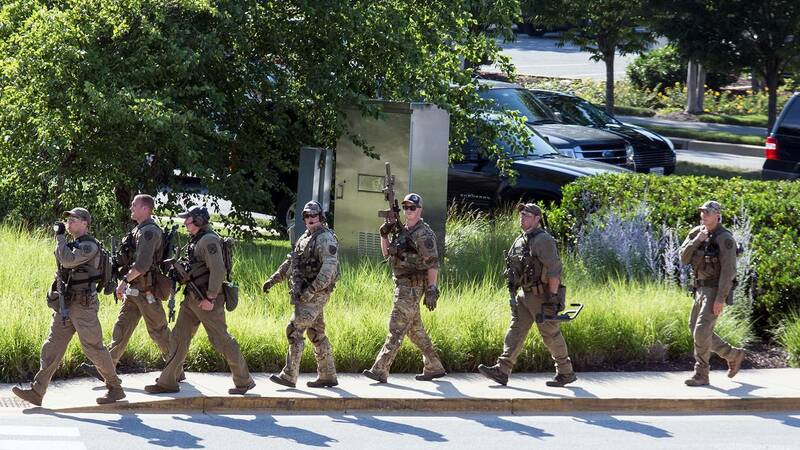 A police tactical team patrols the neighborhood near the Capital Gazette newspaper office. (CNN) - Dozens of businesses and institutions across the United States and Canada received email threats Thursday afternoon, prompting evacuations and sweeps of buildings. It is unclear if Thursday's threats could be related to a series of hoax bomb threats that have been sent via an online messaging service to recipients in multiple states since late August. In a warning reviewed by CNN, the FBI recently shared information with law enforcement authorities nationally about the prior emails sent by an email service called "Guerilla Mail." In Seattle on Thursday, the University of Washington searched possibly affected buildings after receiving threats. It then noted in a campus-wide alert that the FBI had "advised that the email is not a credible threat." Pennsylvania State Police are "investigating some bomb threats in the eastern part of the state," a spokesman for the department told CNN.